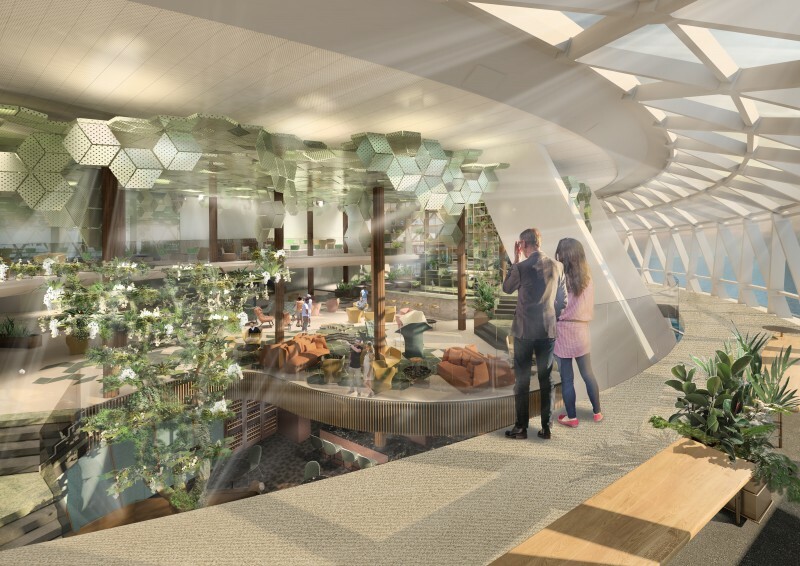 REVEALED: Eden is set to be a passengers’ paradise on board the new Celebrity Edge cruise ship. The venue, announced last night at the Brooklyn Botanic Garden in New York, tries to disguise the fact it was inspired by the spectacular 270 room on Royal Caribbean’s Quantum class vessels, with elements borrowed from the Celebrity Solstice-class atriums. A vast triple-deck space at the aft end of the ship, Eden is claimed to be even more exciting than the revolutionary Magic Carpet which was among the ship’s features announced in March. It will be somewhere to relax with a book, a venue for wine tastings, a restaurant, a cabaret theatre, and a plant-filled greenhouse surrounded by more than 7,000 square feet of glass. By morning, Eden is a place to escape for a coffee and a croissant, looking out on the world outside. In the afternoons it becomes more playful, with seminars and tastings to satisfy passengers’ appetite for cocktails and culinary experiences. Early evening brings Eve at Eden, a sensuous mix of performance art, while at dinner, the Eden Restaurant promises a choreographed series of delicious temptations to surprise and delight – along the lines of the soon-to-reopen New York dinner theatre Queen of the Night. The room’s design is inspired by the golden spiral, as generated by the Fibonacci Sequence, and represented in nature by the organic symmetry of a rose flower or a snail shell. Guestswill be able to take a serpentine walk along a 90-foot ramp, through a space dominated – like the atriums on Celebrity’s Solstice Class ships – by a living tree. A towering Library of Plants, with impressive hanging plant pillars, soars 18 feet above the Eden Bar. David Ley, director of Queen of the Night creators Variety Worldwide, said Eden would “break many of the rules” expected of traditional cruise ship entertainment. Celebrity Edge will carry almost 3,000 passengers on week-long cruises from Fort Lauderdale to the Caribbean. The beginning of construction was marked at a shipyard in France last week by the placing of an 875-ton block in dry-dock. The maiden voyage is scheduled for December 16, 2018.